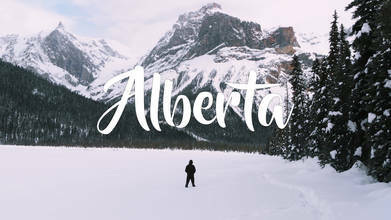 Western Canada's Alberta province, which attracts significant interest from summer travelers, is a magical place in the winter for the properly clothed and sheltered. As the mercury drops and chinook winds bring in polar air masses, the landscape turns to a land of frozen forests and mountain lakes. In this video, contributor Fujibara Films does a phenomenal job of capturing this ice-cold wonderland from an aerial perpective. Description: Everyone always thinks of the warm tropical climates when they hear of a beautiful vacation. Beauty can be found everywhere...even at 30 ºC BELOW! Alberta in the winter is beautiful. There is nothing like standing on a lake, mountain top, or even the highway and hearing the smallest of sounds because it is that remote. It was super cold in Alberta the week i went but i didn't let it stop me from filming. My phone kept warning me about how cold it was. Operating barehanded was a necessity most of the time and I had to push to keep filming.